For those that haven't heard, the ATF has brought back e-forms for Form 1 submissions. Word on the internet is that people are getting approved inside of two weeks. I just submitted my form 1 last Thursday (10/31) and my fingerprints were delivered to the ATF today (11/5). I've got my fingers crossed that mine gets approved as quickly as the others have. 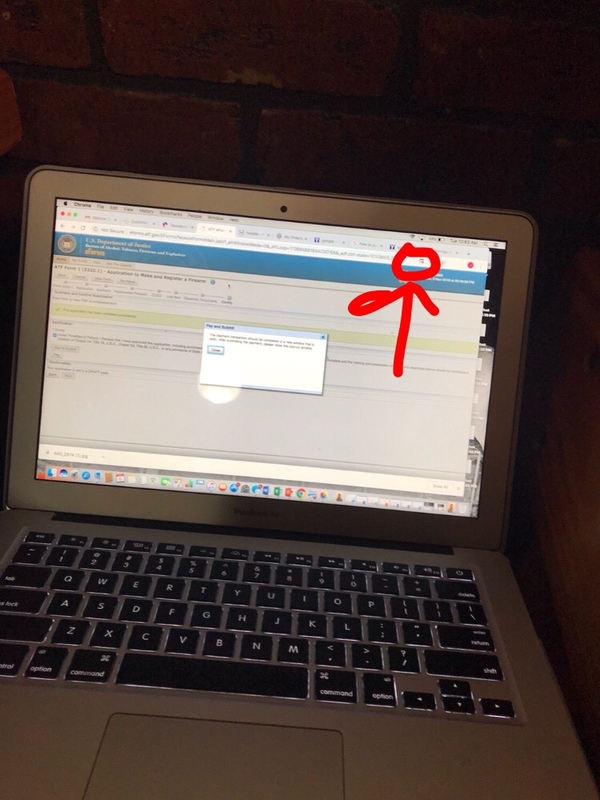 Has anyone else submitted an e-form since they came back? in to see if the "word on the internet" is true... I'm not sure I believe. Maybe they assigned a set of examiners to ONLY work eform submissions and since they are new they can stay caught up for the first month or so, then the floodgates will open. Hoping they can get eform 4's back up smoothly soon. Are you supposed to buy or build the sbr then submit the paperwork or submit the form one then send info? Must have an approved form 1 BEFORE building. Otherwise you have an unregistered item. Here's a few links to approvals. There's several other people that have gotten approved on http://form1suppressor.boards.net/, but you have to be a member to see the thread. Delete this thread until tomorrow!!!!!! Where do you e-file the form 1? Okay so file the lower receiver, Just don’t build the gun? Any idea if I can get my fingerprints done somewhere? Sweet! But dang I’m out of room in the safe. I ordered the forms from the ATF (They're free), then my local Sheriff's Office did them for me. You can also do them yourself if you want. Here is where your order the forms. You can always buy another safe. Have you submitted for a form 1 efile? And did you just scan the prints in with a computer scanner? Once you submit the e-form, the ATF will email you a cover letter with a barcode which you will attach to a pair of Fingerprint cards and send it via snail-mail to the ATF. It would make sense for them to let you submit them online, but the ATF has never been known to make a lot of sense. All of this done within a couple weeks yet they can’t approve a form 4 in 3 months... who do I write the check to for the tax stamp? You pay via Credit Card at the end. Awesome, will post back tomorrow if I get it all submitted! Is there anything special about contacting a cleo? I'm in montgomery county, don't really know how to do it though. Last edited by justindiehl7; 11-05-2018 at 09:34 PM. The email you get at the end with the fingerprint cover letter will also include a paper copy of the form 1. You will just mail the portion of the form that says "CLEO Copy" to your local Sheriff's Office or Police Dept. I believe you can also mail it to the director of the Texas DPS if you want to stay off the radar of your local authorities. It used to be that the CLEO had to sign off on the form, but you only have to notify them now. There's lots of information on CLEO notification online if you need more explanation or want a second opinion. I'm in no ways an expert or lawyer. You’re much more experienced than I, I appreciate your help sir! Yes sir. Not a problem. If you are filing as an individual, you do nothing. If you are filing as a trust, I believe that’s where you upload the trust. You need to enable pop ups for your browser. You’re awesome, I appreciate it! Can you E-file form 4 if you go through a trust? sorry if I missed this. Form 4 isn't available yet. According to the ATF, it is in the works. Finger prints are done, forms are all submitted. Just print out everything sent to me then mail it to the atf along with both sets of fingerprints? Just mailed my prints for an SBR. Hopefully it hasn’t already gotten bogged down. No matter what, it should be better than the paper form I filed a month ago. ATF said 30 days most likely, confirmed by silencer shop, SS is doing e-files starting tomorrow, and their trial run was approved in 5 days. I’m one of the first at SS to get sent in so we will see how long it takes! Never done this but want to is form 1 for SBR or silencer also what is form 4 for? Form 1 is creating a NFA item like an SBR, SBS or homemade suppressor. 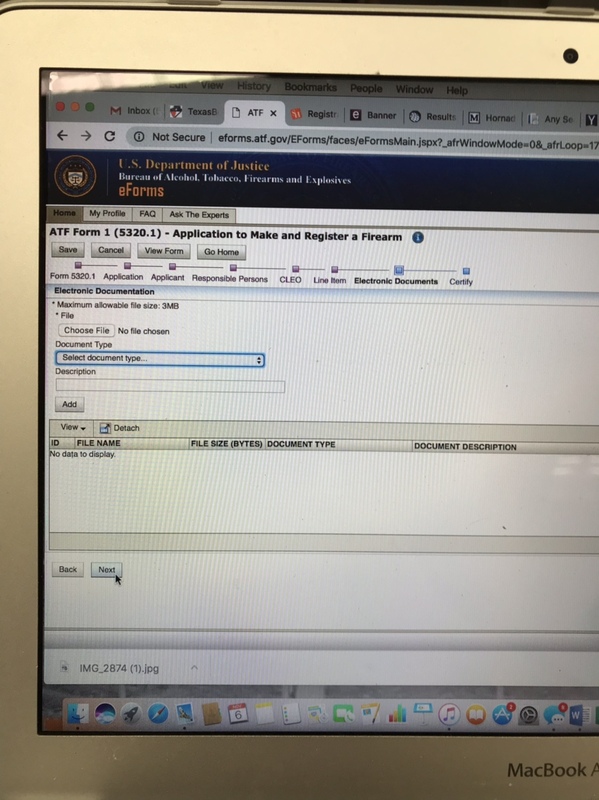 Form 4 is transferring an NFA item. So the only thing expedited right now is the former. Following. Just found the Eform site, and it said it’s down for the night. Figures. I’ll look at it again tomorrow. Yeah, I think that's a pretty regular occurrence with their crappy website. It was down last week for like three days, and it goes down every Wednesday from 4:00 AM to 6:00 Eastern Time for "scheduled maintenance." You would think that they would upgrade their site so it would be a little more reliable and easy to navigate, but it is the government we're talking about after all. I got it. It just didn’t show up on the phone. Got my forms submitted and fingerprints just mailed.